From February 1 - 27, 2019 enjoy 10% off our Fertrell Liquid #3 2-3-1! All sizes! See details at the bottom of this post. Purchase the Quart size of Liquid #3 2-3-1 from our e-commerce site! Use the code Feb10 at checkout for the discount! 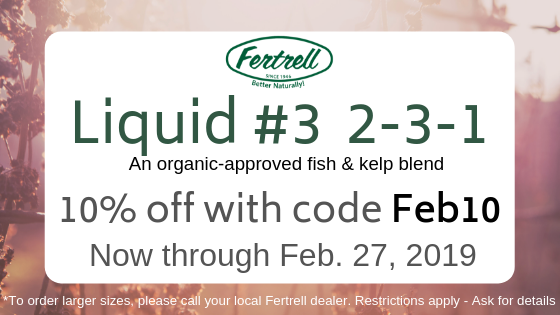 Fertrell Liquid #3 2-3-1 is a combination of Liquid Kelp and Liquid Fish. It is able to be used as a foliar spray or in your fertigation system without any issues of clogging. Fertrell Liquid #3 is also a product that is great in any transplant solution. The Liquid Kelp is able to help a plant during periods of stress because the plant is able to uptake a hormone called a Plant Growth Regulator (PGR) which is a hormone that all plants create. The Hormone has several significant benefits that all plants will thank you for. But why would you use this product? A farmer will use this product when they want better, more vibrant growth and bigger, heavier harvests. Whether that’s through telling a plant to stretch its cells to grow larger or to allow cells to form dense fruit, when you give your plants PGR’s the goal is to manipulate how the plant grows. This on top of the fact that the liquid fish is able to give you some very digestible Nitrogen as well as some additional biology for you plant and the soil or soil medium make for a very potent product that will be able to help your crop deliver. If you are a farmer who is trying to push your crop for more production, if you are a farmer concerned about you plant under-performing, or if you are a farmer that wants to ensure that your plants have a healthy and consistent growing season Fertrell Liquid #3 is something that you should heavily considered.